Built by Shri Satya Sai baba in 2009, this beautiful temple of Pandurang is situated at Hadshi & spread on 300 acres surrounded by lush green mountains, this is a must to visit place with family and kids for Weekend picnic. This temple consists idols of Lord Vitthal, Rukmini and Shri Ganesh. This two storied mandir has an upper level featuring the idols of Vithoba Rakhumai (Panduranga Vitthala) and the lower level is dedicated to Shirdi Sai Baba and Satya Sai Baba. In case you wish to meditate, a meditation hall is available below temple. 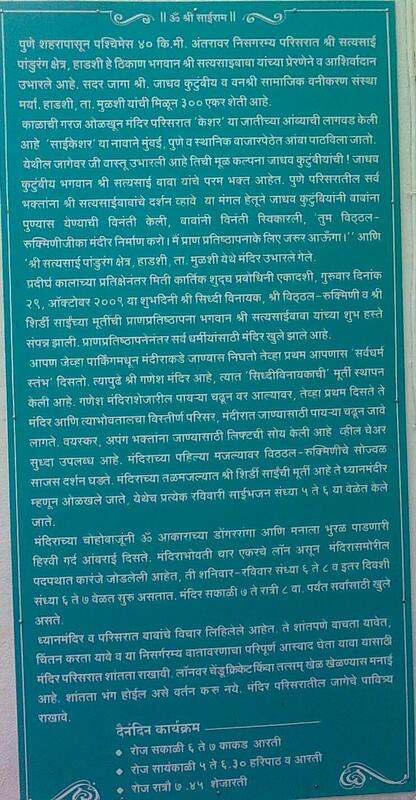 Mr. Jadhav is the Land owner of this area & he built temple according to Shri Satya Sai baba. Museum is shaped like ॐ and walk through tunnel. It consists of beautiful sculptures that exhibits different deities and saints of Maharashtra and other parts of India. You can spend an hour or so to walk through all the exhibits in the museum. I felt if pretty high, however considering maintenance of the facility you must help them by paying this premium. Boating : There is boating place 1 km away from the main entrance. Pune Chandani chowk to Bhugaon to Pirangute to Paud to Hadshi. Old Pune Mumbai road to Pavana dam road take a left turn to reach Hadshi. Best way is to take your tiffin and enjoy over beautiful landscaping in front of temple.